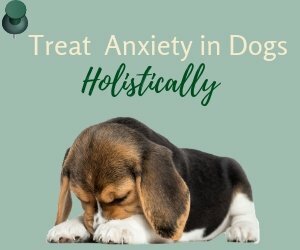 Why Do Dogs Need Coenzyme Q10? Coenzymes are non-protein substances that combine with protein to form a complete enzyme. One important coenzyme is Coenzyme Q10 (CoQ10, aka ubiquinone), which very much resembles vitamin E and is vital in helping prevent and treat chronic illnesses. CoQ10 is produced by the liver and found in every cell in the body. It plays a fundamental role in the mitochondria (parts of the cell that produce energy). It controls the flow of oxygen within the cells and is needed and used by all cells to produce energy for cell growth and maintenance. CoQ10 also functions as an antioxidant that reduces damage to cells due to oxidation from harmful free radicals. In addition, coenzyme Q10 helps enzymes to digest food and helps protect the heart and skeletal muscles. Foods that are rich in CoQ10 include oily fish such as mackerel, sardines, and salmon; as well as organ meats (e.g. liver, kidney, heart). However, similar to enzymes, CoQ10 can be destroyed at temperatures above approximately 115°F (46°C). Heart Health: Heart muscles work non-stop, so the heart muscle cells need all the energy they can get. CoQ10 is extremely important for providing energy to the heart and for cell growth and maintenance. The heart needs CoQ10 to ensure normal healthy circulation. Periodontal Disease Prevention: Mouth tissue cells have high turnover rate. They require sufficient amount of CoQ10 to prevent gum disease, abscesses, and so on. Coenzyme Q10 can also decrease oral ulcers in dog cancer patients as a result of chemotherapy or radiation. Gastrointestinal Health: The cells lining the GI tract also need a lot of energy for cell growth and maintenance. As such, coenzyme Q10 contributes to a healthy GI tract and prevents diseases such as ulcers, inflammations, etc. Liver Health: Cells of this organ also have a high turnover rate, and CoQ10 provides the energy needed for liver cell growth and repair so that chances of developing liver disease are lowered. Brain Health: Brain cells, which need enormous amount of energy, can definitely benefit from coenzyme Q10. CoQ10 can help dogs, especially older dogs, maintain a sharp and alert mind. Immune Boosting: CoQ10 has been shown to stimulate the immune system and may have indirect anticancer effects through its effects on the immune system. Antioxidant: CoQ10 is a powerful antioxidant that is used in cancer, specifically to minimize heart toxicity from the chemotherapy drug Adriamycin (doxorubicin). 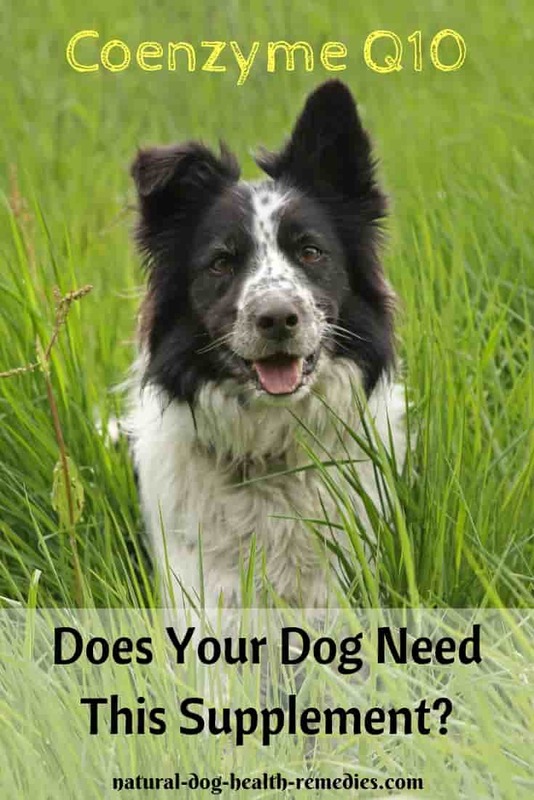 Do Dogs Need Coenzyme Q10? 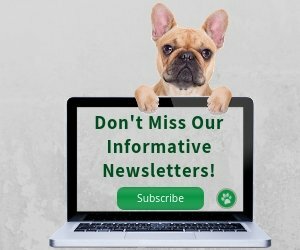 Dogs reaching 7 years or older should be supplemented with ubiquinol (the active form of CoQ10) because their ability to convert CoQ10 into ubiquinol declines with age. Dogs who are on diets cooked under high heat (e.g. commercial foods like kibble) should be supplemented. Dogs with heart disease or breeds that are prone to development of heart problems should definitely be supplemented. Active dogs (e.g. hunting dogs, dogs training for agility) can benefit from this supplement for muscle growth, maintenance, and repair. Dogs with periodontal disease (e.g. gingivitis) and mouth inflammation should also be given CoQ10. Dogs with GI problems (e.g. ulcers, colitis, etc.) and liver disease (e.g. liver inflammation) can benefit from this supplement. 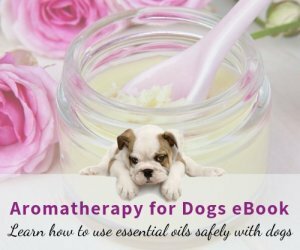 Dogs with cancer and those with weakened immune systems may benefit from this supplement. As a general guideline, recommended dosage of CoQ10 for dogs is 1 mg per pound of body weight once daily. Since CoQ10 is fat soluble, it is better absorbed when taken as an oil-based gel (as opposed to a dry tablet). If you only have dry tablets, give up to 3 mg per pound per day. Is Coenzyme Q10 Safe for Dogs? 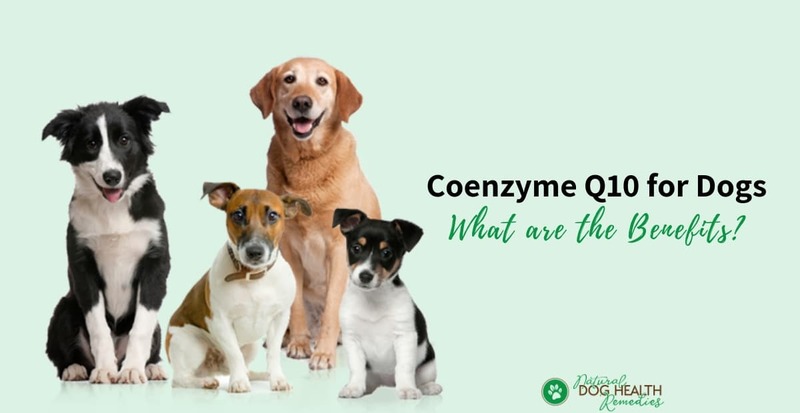 Coenzyme Q10 is safe for dogs and there is no report of serious toxicity associated with its use. As with all supplements, consult with your vet first before giving CoQ10 to your dogs, especially if your dog is very young, pregnant or nursing. Dr. Harvey's Coenzyme Q10 for Dogs is made especially for pets so it is easier to obtain a correct dosage. It also contains vitamin E for easier absorption and added synergy. Stay Well Pets Liquid CoQ10 enables eight times higher absorption than standard CoQ10, and since it is in liquid form, it is even easier to dose for smaller pets. Dr. Mercola Ubiquinol for Pets is in the form of ubiquinol (the active form of CoQ10) and is especially recommended for older dogs, whose ability to convert CoQ10 to this active form declines with age. C. Schwartz, Four Paws Five Directions (Celestial Arts, 1996).